In February this year, I got a brief look at A.A. Chadwick and Arthur E. Chadwick’s’ new book, The Classic Cattleyas. Before I could get a copy of this book to review, I heard it was sold out. It is available, however, from Timber Press for $49.95, even if it is sold out at your favorite book store. Classic Cattleyas is everything I hoped it would be by one of the world’s foremost cattleya experts, Arthur Chadwick, and his son, who is one of an emerging cadre of new orchid entrepreneurs. For many years, members of the American Orchid Society have enjoyed the senior authors many articles on Cattleya species in their monthly magazine “Orchids”. At the end of each article, readers were always left waiting for the next installment. Now it is all in one place, free from the confines of a monthly orchid magazine. The Classic Cattleyas combines all of what A.A. Chadwick gave us in his many articles in a comprehensive and easy to read form, well illustrated with photos of both the common forms and some examples of the unique varieties that appeared over the years. 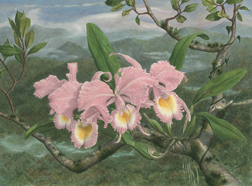 Readers are introduced to the Cattleya species just as they appeared to Western Civilization, i.e. in chronological order of their discovery. The junior author of the book is well known to many throughout the mid-Atlantic as a willing speaker and columnist on orchids and greenhouses. He currently manages Chadwick and Son Orchids in Powhatan, Virginia. This father and son team combined their perspectives and experience, old and new, into a book that is useful to both expert and novice orchid growers. In fact, there are two books; one for the beginner anxious to grow and flower this amazing group of orchids and another for the advanced hobbyist who wants to understand the complexities of orchid taxonomy and relationships between species. Serious growers will read this book many times as they grow more expert and appreciate both levels of knowledge contained in these 10 chapters. Those readers that are botanically oriented will appreciate the historical twists and turns that resulted in the current botanical name assigned to each species. More important to some, is the description of each species and its unique characteristics. For those species easily confused with other species, William Rogerson’s approach to separating confusing species using growing characteristics along with flower color and size is advanced. Cultural tips on growing some of the more temperamental cattleya species makes this a reference book that I keep close at hand. Even hybrid cattleya growers that do not grow the species will glean important cultural requirements of some hybrids because they take after cattleya species in their backgrounds. Long-time cattleya growers will applaud the Chadwick’s’ inclusion of the large-flowered Laelias into the cattleya group where they belong. There is an excellent introduction to some of the major lines of cattleya hybridizing as well as an excellent chapter on culture including repotting and diseases. Photos of most of the common diseases and pest-induced problems are included and will be very useful to hobbyists growing cattleyas for the first time. There is a chapter on cattleyas in art, which may seem out-of-place in a horticulturally-oriented book, but is not. Much of what we know about many early species and forms of these species comes from paintings and illustrations. Earlier chapters place great emphasis on the difficulty botanists had because of inadequate specimens and illustrations. In our current digital age, it is easy to dismiss the work of past and present artists. This chapter makes it clear that an artist’s eye can capture far more than any lens, digital or optical. The Classic Cattleyas is a remarkable contribution to the Orchid World in general and for all of those new and future hobbyists who may have never heard about these remarkable members of the orchid family. While the title may seem like this book is only for Cattleya growers, it really tells the story of the discovery of tropical orchids by western civilization. Every orchid hobbyist should have a copy even if they do not grow cattleyas.